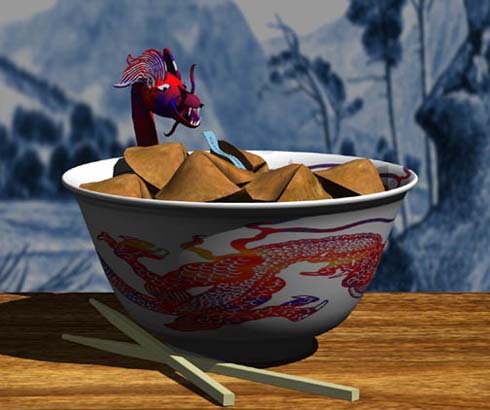 Part of a commissioned promotion piece, which included an animation of a fortune somersaulting out of a fortune cookie. The cookie texture was obtained by moistening some real fortune cookies so they'd open and flatten, then scanning them. The dragon shares a great deal of DNA with She Monster and the Viking ship. More spheres, cylinders, and extruded shapes at work. Since absolutely no etiquette or cultural research was done before creating this piece, there's an excellent chance the placement of the chopsticks is rude in some manner. Come to think of it, why are there chopsticks beside a bowl of fortune cookies? Perhaps it makes as much sense as the miniature dragon.